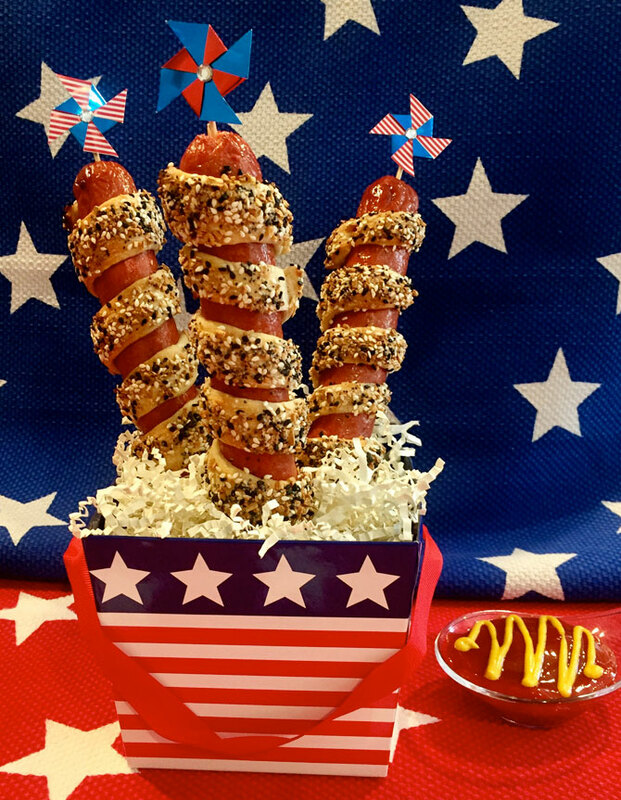 Dazzle the crowd and make these firecracker hot dogs for your 4th of July party…the seasoning adds fabulous flavor and they’re the perfect hot dog on-a-stick! Preheat the oven to 375ºF. Line a baking sheet with parchment paper or a silicone baking mat. Insert a skewer through each of the hot dogs, leaving 1/2-inch of hot dog exposed at the top. Take one piece of the bread stick dough or cut a 1/2-inch wide and 8-inch long strip from the pizza dough and wrap the strip of dough around each hot dog, leaving space between the concentric circles of dough. Repeat with the remaining hot dogs. Place the Everything Bagel Seasoning on a flat plate and roll the wrapped dogs in the seasoning. Place the dogs on the prepared baking sheet and bake for 12 to 15 minutes or until the bread dough is golden brown. Serve with your favorite toppings.